This article was written on 28 Nov 2016, and is filled under Gallery, Past Exhibitions. The BFA Entry and Junior Review begins with a reception for the students, their family and friends on November 28 from 5-7 pm. 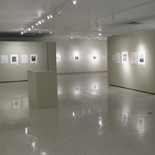 Faculty members review the exhibit on Tuesday and Wednesday followed by face to face reviews with a faculty panel. Exhibiting artists are: Mary Abbott (Junior), Elizabeth Christianson (Junior), Marie Galvin (Junior), Samantha Azzara (Entry) and Brianna Kruger (Entry).